NARC, FHWA, and the Eno Center for Transportation hosted a webinar to discuss the trends, issues, and importance of scenario planning in transportation. The webinar focused on the FHWA publication, The Next Generation of Scenario Planning – A Transportation Practitioner’s Guide, and the forthcoming NARC report, Advancement of Performance-Based Scenario Planning for Regional Planning and Decision-Making, which surveyed 24 regional entities on their use of scenario planning. Both reports will be available soon. 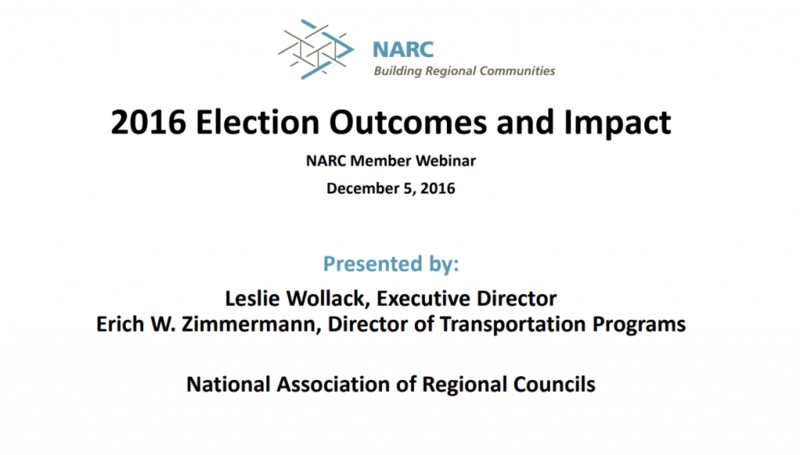 2016 Election Outcomes and Impact (December 5, 2016) During this webinar, NARC provided an in-depth analysis of the 2016 election results and examined what regions can expect in the near future. The webinar focused on the post-election lame-duck period and potential policy changes during the first 100 days of the new administration on issues such as infrastructure and economic development. In addition, NARC staff briefly discussed key leadership and congressional committee changes, President-elect Trump’s cabinet choices, the presidential transition, and House and Senate election outcomes. After it was determined that Volkswagen (VW) had intentionally violated emissions controls, VW has agreed to settle by spending up to $14.7 billion to remediate the excess NOx emissions. A majority of this money is going to vehicle buyback and modification programs ($10.03 billion) for affected consumers — but $2.7 billion of this settlement money is going towards NOx reduction programs via the Environmental Mitigation Trust with an additional $2 billion going towards ZEV programs around the country. Ben Prochazka from the Electrification Coalition provides an overview that includes general information about the current status of the consent decree (as of 11/2016), the anticipated timeline, and how this funding can be used to accelerate vehicle electrification. The U.S. Department of Energy’s Clean Cities program supports local actions to cut petroleum use in transportation through nearly 100 local coalitions around the country, some of which are housed in regional councils. The program maintains a variety of unbiased, informational resources and interactive, data-driven online tools that fleets and consumers can use to learn about ways to lower emissions, save money, and use less petroleum. This set of tools allows users to calculate a fleet’s footprint, including economics, greenhouse gas emissions, and petroleum use; compare alternative fuel vehicles and technologies; locate alternative fueling stations; identify relevant incentives and laws; find case studies on how public and private fleets are using alternative fuels; identify and track trends in alternative fuel deployment; get answers to technical questions; and much more. In this webinar, we will learn about Clean Cities and its initiatives, take an in-depth look at some of these tools, and hear how your organization and your stakeholders can benefit from using them. Want to bring solar to your region? NARC created this video to promote strategies a regional council can take to increase solar deployment in their member jurisdictions. GIFToolkit.org is designed to be a one-stop-shop for information and resources on green infrastructure and urban forestry. Featuring a series of essential guides, outreach templates, calculators, GIS mapping tools, and case studies, GIFT makes green infrastructure planning easily accessible to communities nationwide. Click here to view archived webinars.